A new watercolour book of iconic modern architecture is now available! New watercolour prints and etchings added! Douglas studied painting, sculpture and pottery before completing his first degree in architecture at Cheltenham School of Art. His second degree was attained at the Leicester School of Architecture, now De Montfort University, where he also completed a post graduate course in Landscape Architecture. Douglas now concentrates on painting and sketching. Fascinated by light and colour, seeing through the eyes of an architect with a visual and spacial awareness, he brings to his paintings a sense of place. His watercolours are in collections of Europe, America and Canada. 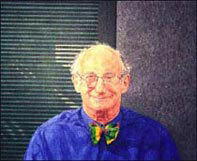 Douglas is an Architect Artist and author of eight books on architecture, design, paintings and sketches. He held an unprecedented term of office as President of the Leicester Society of Artists for 27 years. Douglas donates all the money from the sales of books and prints to the Leicester charity for cancer research. The chief curator Charles Hind organised an exhibition in the library of the royal institute of British Architects for the Doric Club Lunch on 3rd July 2017 with some of the treasures from the V & A collection. It started with Palladio, Robert Adams, Frank Lloyd Wright and finished with Douglas Smith as the first image. The new book, ‘ICONIC MODERN ARCHITECTURE’, was published in 2015 and is the culmination of Douglas’ journeys. With sketch book in hand, he searched around the world for inspirational buildings and gardens. Douglas Smith, generously funded the creation of the Leicester Society of Artists website, commemorating his 27 years as LSA President 1987-2014. See Douglas’ member page and discover more on the LSA website. For your security and peace of mind, no orders are being taken over the internet. I hope you enjoy browsing and I’m sure you’ll enjoy your books or prints even more.